T-Mobile announced today that the plan used by its members who travel globally, Simple Global, is now supported in 70 more countries and destinations. That brings the total to over 210 countries and destinations where T-Mobile's service is available. Included free with T-Mobile ONE plans, Simple Global offers free 2G unlimited data, unlimited text and low-priced calls. T-Mobile ONE subscribers traveling overseas do have a way to upgrade to LTE data and unlimited calls. By purchasing an International Data Pass for only $5 a day, T-Mobile ONE subscribers can use 512MB of LTE data daily, with unlimited text and talk. The daily price is half of the rate charged by Verizon and AT&T for their daily Data Passes for use out of the country. 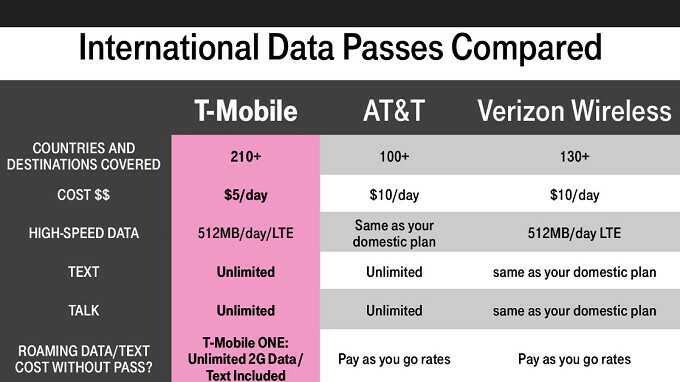 The new T-Mobile International Data Pass will be available starting on August 1st (check out the image at the top of this article), and the new countries get added to Simple Global on July 22nd. The Simple Global package includes picture messaging, visual voicemail and one hour of in-flight Wi-Fi on flights that feature Gogo. If you do travel out of the country often, you might want to consider T-Mobile's Simple Global plan, which as previously noted, comes with a T-Mobile ONE subscription . If they don't have int'l data roaming options for prepaid customers (like myself), I'm not interested. Does anyone know what the max LTE speed is for this new data pass announcement?? Is it capped at a certain data speed?? Thank you. Would have been much more impressive if it was unlimited let data at $5/day instead of 512mb. No streaming with this plan. I guess it's good if you're only using it for social media or messaging apps. Just get a prepaid sim card at the destination. Cheaper & Faster. Tmobile global free data speed is extremly sloooooow as hell.